Many articles are written by and about RPCN members. Here's where we get to brag! Please note that where you find a direct link to an article, it may no longer exist if the publication has chosen to archive it by the time you read of it here. 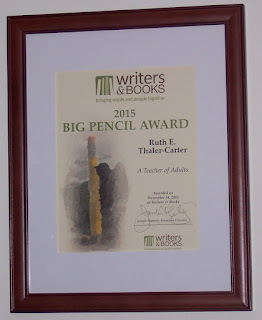 Brighton Chamber member Ruth E. Thaler-Carter received a 2015 Big Pencil Award from Rochester's Writers and Books literary center in November as a "teacher of adults who has inspired the creation and appreciation of literature" and someone who has "contributed significantly in the advancement, creation, and understanding of literature in the Rochester community." According to Writers and Books' education director Al Abonado, "Good grammar, editing, proofreading: these are practices that we often take for granted, but are also a necessary part to crafting our stories. For years, Ruth Thaler-Carter has been the generous, guiding hand that has helped individuals develop these habits. The breadth of her knowledge is not just limited to the foundations of language. Ruth understands that the landscape for writers has changed dramatically over the years, and for the uninitiated, entering the world of publishing and promotion for the first time can be intimidating. Ruth has given writers the tools they need to succeed, and does so in a way that is clear and accessible. Students frequently praise her knowledge and thoroughness. At the recent self-publishing fair, one could see the number of students influenced by Ruth's classes. She has been an important part of the writing community, providing essential services to so many people, and I am thrilled to be able to recognize all of Ruth's contributions to our students." Author/Publisher, "Get Paid to Write! Getting Started as a Freelance Writer"
RPCN member Michel (Mike) Frantz Molaire of Penfield is among about 100 African Americans recognized in a permanent exhibition that opened November 10 at the Charles H. Wright Museum of African American History in Detroit. “Inspiring Minds: African Americans in Science and Technology” highlights trailblazers, contemporaries, and careers in the fields of science, technology, engineering, and mathematics. The 125,000-square-foot museum – the largest black history museum in the world – is named for founder Charles H. Wright, MD, an obstetrician and gynecologist. Molaire retired in 2010 after 37 years with Eastman Kodak in materials and formulation research and development. He holds 58 U.S. patents and about 120 foreign patents. His consulting firm, Molaire Consulting LLC, helps clients develop materials, coatings, processes, and formulations for high-tech applications, including polymer coating development, nano materials, pigment dispersions, and dip coat processes. He is also a professional photographer at houseKALLfotography. Molaire's professional and community involvement has included serving as president of the local chapter of the National Association for the Professional Advancement of Black Chemists and Chemical Engineers (1984-86) and as a member of the Kids on Track Committee of the United Way of Rochester (1997-2006). For more, see Mike's RPCN profile. Ingo Leubner's business Crystallization Consulting has been chosen as "Business of the Month" by the Penfield Business Association. To see the entire publication describing this honor, CLICK HERE. The difference between prosperous nations and failed states, affluent societies and struggling ones, rich people and poor people, most times is their desire to leave lasting legacies. One group focuses on leaving valuable skills and information to coming generations, whereas the other is only concerned with gratifying their present desires. Leaving a legacy has to do with having a futuristic approach to everything you do. Think of those that will benefit from your existence after you’re gone. This doesn’t call for any special skills, but a conscious decision to live a life with a desire to leave a lasting legacy. I refer to it as Generation Preservation. Many people don’t understand that leadership is situational and think that if they don’t hold an official position they cannot leave a legacy. One time tested expression is “[i]f I cannot do great things, I can do small things in a great way.” That is the essence of leaving a legacy, and everyone has the time to think about how they’ll be remembered. Make sure your assets are positioned correctly not only for yourself, but also for those who may reap the rewards of your labor. Having a will is a cornerstone of most investment accounts. A well-designed trust can be a prudent estate planning tool to assure assets and property are transferred efficiently. Life insurance and annuities with death benefits are very popular techniques used to protect and pass on wealth. When it comes to these and other important documents, remember to keep clear records about how, what, and where your assets are held and review them regularly with your financial advisor and/or attorney. One fairly common example is a life insurance policy that never gets paid out because no one knew to simply forward a death certificate to the insurance company. This can happen for several reasons undefined it may be very old and information was lost, the contact was misplaced with a new agent or company, or perhaps a few payments were missed because no one was paying attention and the policy lapsed, sacrificing thousands of dollars to the beneficiaries. Unfortunately, it’s all too common and sad and can mean a great deal to the next generation. Generation Preservation is about creating an inventory of what’s important. It’s a decision to write down, leave instructions, assemble memories and personal information so important people in your life will learn about and remember what’s significant to you and your generation. If you think about it, it’s not really about you. It’s about the ones you love having to deal with the decisions and material items inevitably left behind. It’s easy to say, “I’m not worried about it, I’ll be gone,” but leaving a tangled and expensive mess is all too often the case. After all, it’s your legacy, preserve it well. Contact Glen for more information, request a copy of his book “My Story In Trusted Hands,” or schedule a speaking event on this topic. Glen Cone is an independent financial advisor with Commonwealth Financial Group, 1633 Empire Blvd, Webster, N.Y., and cohosts “The Money Doctors” on WHAM 1180. He can be reached at (585) 248-5150 or gcone@ae.cadaretgrant.com. To view Glen's article as it appeared in the Daily Record, click HERE. Shailesh Kadakia, Matrix Writers and Publishers, announces the publication of the Second Edition of his book, "True Physics of Light, Beyond Relativity." Written for both experienced and novice readers, this newest edition of the book provides complete knowledge beyond the creation of a broad range of radiation energy waves. The book stresses reality based relativistic principles and their practical applications to astronomy. A sneak preview of "True Physics of Light, Beyond Relativity," can be found at http://www.matrixwriters.com/second_edition.html. The book will be available from Amazon.com and many other booksellers soon. Ruth Thaler-Carter Reviews the Book, "Though Not Dead"
Ruth Thaler-Carter as been published in the Washington Independent Review of Books. She has reviewed the book, Though Not Dead: A Kate Shugat Novel, by Dana Stabenow. Dorothy Madden of ORGANIZE IT! Margit Brazda Poirier, Owner of Grants4Good, recently co-authored an article that was published in the Annual Journal of the Grant Professionals Association. The article, Strategies for Successful Site Visits: Tips and Techniques for Grant Professionals and Managers, contains tips for improving site visits from private, corporate, and community foundations, as well as how to survive (and thrive) during a federal government audit. Rochester's very own Ed Doherty, from the Rochester Area Community Foundation, was interviewed and offers his advice. For a copy, contact Margit at grants4good@gmail.com.